Chicago’s Wrigley Field opened in 1914 as Weeghman Park, the new North Side stadium erected for use by the Federal League’s Chicago team, which would eventually be called the Whales. It was built in just 50 days, with an rectangular shape in the style of New York’s Polo Grounds, designed to fit the odd dimensions of the lot-which formerly housed a seminary school-that Whales owner Lucky” Charley Weeghman had purchased with a 99-year lease at a little over $300,000. In all, it took $250,000 and a plenty of scrambling to build the park. That seminal event is at the heart of Before Wrigley: The Inside Story of the First Years of the Cubs’ Home Field . 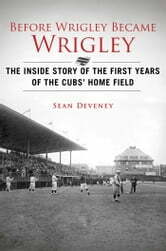 The book will explore the early years of Wrigley Field, when it bore a different name and housed a different team. Sean Deveney has mined documents and resources from baseball’s Hall of Fame in Cooperstown, as well as the Chicago History Museum, to supplement the reports in newspapers and magazines of the day, giving readers a behind-the-scenes look at origins and birth pangs of the park. At the center of the Before Wrigley drama is a cast of typically colorful Chicago characters, particularly Weeghman, the young and flamboyant restaurant man who started out in the city as an $8-a-week waiter, eventually became a millionaire baseball magnate, and then lost everything. There’s tightwad owner Charles Murphy, who oversaw the Cubs’ early 20th century dynasty (yes, there was a Cubs dynasty), only to run off his famed infield of Tinkers, Evers and Chance, and be run out of the game himself. There are crooked baseball officials like Ban Johnson and Garry Herrmann, crooked politicians like mayor Big Bill” Thompson, rogue ballplayers out to make a quick buck or two and, of course, the generally fair and hard-working citizens of Chicago. Using careful and detailed research, incorporated into the bizarre and gripping narrative of the city, the game and the team in the mid-1910s, Before Wrigley gives Cubs’ fans a rollicking account of their beloved ballpark’s little-explored early days.